Each year, over 40 million people pack their bags and hit the road with friends and family members to spend time in the great outdoors. Camping is a popular activity for people of all walks of life simply because it can provide a much needed break from the sometimes hectic city life, and because it may be one of the easiest and least expensive vacations on the planet. Furthermore, camping is connected with a number of other activities such as backpacking, hiking, fishing, marshmallow roasting, and other activities you don’t often get a chance to participate in on a daily basis. It is possible to camp in nearly every corner of the world, but there are areas and campsites which are rated better than others. 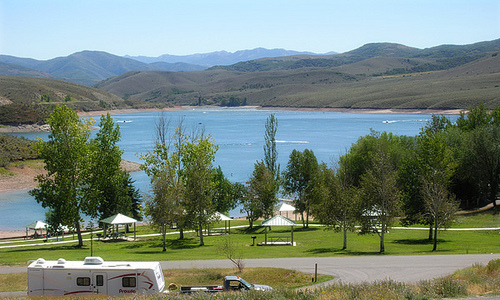 Whether you prefer roughing it in a tent or hooking up an RV, Utah has some of the best areas for camping in the United States. Residents lucky enough to live in the state and visitors alike can easily find hundreds of local campsites, many of which are free. Furthermore, Utah provides everything necessary for a great camping trip – scenic mountain views, beautiful, clear water, and some of the oldest trees in the country. For this reason alone, Utah is considered one of the most ideal destinations for great camping. Choosing the best campsites in Utah can be difficult but here are the top 10.